When a baby is admitted to a neonatal intensive care unit (NICU), life can be quite stressful for the baby – and for the parents. Mothers often report that being separated from their babies, especially not being able to hold their babies, is particularly stressful. Researchers at University Hospital, Linkg, Sweden wondered whether encouraging skin-to-skin contact might reduce stress. The exciting results of their study appear in the November 2005 Pediatrics. Previous studies have shown that kangaroo, or skin-to-skin care is safe, and can improve breastfeeding rates and improves bonding between mother and infant. It can act to effectively reduce pain during uncomfortable procedures. And it can reduce medical complications when compared to incubators. What does skin-to-skin care do for stress? 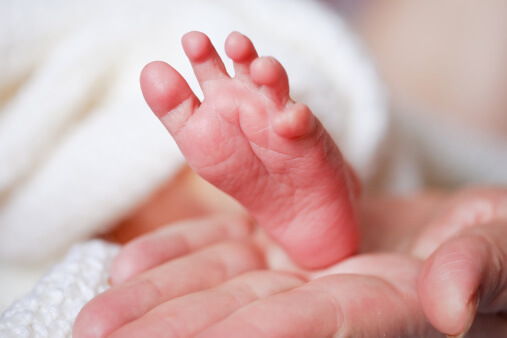 The researchers studied 17 preterm babies from 25 to 33 weeks gestation to find out. First, they measured cortisol levels in the saliva of the babies, recorded their heart rates, and because pain is one facet of stress, used 2 different pain scales to assess their comfort. In their mothers, they also measured cortisol, heart rate, and visible stress levels, as well as having them perform a mood survey. Everyone was stressed before the first skin-to-skin contact. Mothers also reported low mood, especially low levels of control, calmness, and pleasantness. Then, the mother changed into a hospital gown that opened down the front. The baby was removed gently from the incubator and placed on the mother’s chest in an upright position. The baby was wearing a cap and a diaper. She or he was placed inside the mother’s hospital gown with extra blankets on top. The mother was given a mirror so she could watch her baby’s face while they cuddled. The father was sitting on a chair close to the mother and baby. The babies were immediately less stressed. But the effect on the mothers was even more dramatic. And by the fourth 30-minute session, when moms were comfortable holding their tiny preterm babies, their stress hormones had fallen by 32 percent, their stress indicators had dropped by 89 percent, their heart rates had relaxed, and their moods had increased significantly. I only wish that the fathers in the study had also enjoyed sessions of skin-to-skin care. What a simple, wonderful way to make life better in the intensive care unit – for babies and also for parents!